What are they DOING? What could be more important than talking to you? Foursquare. At least, that’s their goal – to become the number 1 cause of phubbing whenever you go out with friends. As an early adopter, Foursquare was a fairly solitary pass-time as it didn’t immediately catch on. The idea is that you have an app on your phone which uses GPS to identify where you are and you “check-in” at businesses, shops and venues. You can add pictures, reviews and tips and it can post a message to your Twitter account that You Are Here, with a little map so people can stalk you. The more times you check-in at a given location, the more points you accumulate and you’re rewarded with little virtual badges and “mayorships”. Other users can “friend” you and track your movements (as much as you logged on the app anyway), make comments on your comments, battle you for mayorships and other virtual badges. Eventually I got bored. Last December I posted my final check-in and pretty much forgot about Foursquare until recently when I noticed that I was getting a lot of friend requests again. Clearly something was going on. Logically, having been around for a while, 4SQ has amassed a lot of data so it’s become more useful as a tool to read reviews and tips. This is good for customers and very interesting for venues who are smart enough to have a look. There’s also a “More Like This Venue…” list of places that are nearby to your current location and “Places people like to go after This Venue”, among other useful information. Foursquare has grown up to be a very good What To Do guide for wherever you are. You could conceivably now live large chunks of your life following 4SQ’s recommendations without having to make any decisions about where to go next, and you’ll have a pretty good idea of what to expect before you even get there. Last week Foursquare announced that new versions of its app will be rolled out over the coming months, starting with Android users. Despite an article on their blog claiming that it’s available for my Windows 8 phone, it isn’t, so I can’t review the app firsthand but I can certainly tell you what it claims to do. It gets “pushy” – as in, it now uses push notifications on your device to ping you if it thinks you need to know things. If you enter a venue you’ve never been before it pings you to pass on tips of what other people recommend you consume or do now you’re there. Even if you’re a regular it might buzz to inform you the vendor is running a promotion which might be of interest. This is even if you’re not signed in or have the app open, and it’ll use the equivalent battery expenditure of 20 minutes of playing Angry Birds to do this every day. Personally I think that sounds annoying. I always say no to push notifications so I won’t be getting any little pocket buzzes on my phone, but the information will still be there if I choose to check-in. I’ll post a proper review when the app becomes available. 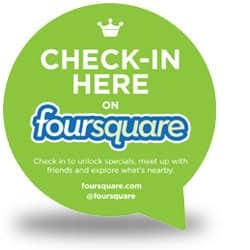 If your business is listed on Foursquare, you’d be mad not to have a peek at what people are saying about you, and perhaps even use it promote 4SQ user only offers. It might even be fun!